Melissa Lamie is in her seventh season as Grove City College's head men's and women's golf coach. In 2011, she guided the Grove City women's team to the Presidents' Athletic Conference title. Grove City produced the conference's Player of the Year in Arielle Goyzueta and three teammates joined her on the 2011 All-PAC team. For her efforts, Lamie received the league's women's golf Coach of the Year award. Last year, she guided a very young Grove City women's team to a third-place finish at the rain-shortened conference championships. Esther Durling earned PAC Player of the Year honors. In her first season as head coach, she led the men to a second-place finish and the women to a third-place finish in the Presidents' Athletic Conference Championships. During her first five seasons as head coach, Grove City golfers have earned numerous honors. A total of 14 different players (six men and eight women) have achieved All-Presidents' Athletic Conference recognition. Grove City's men's team has won three invitational titles and recorded five other runner-up finishes during that span. The 2007 men's team placed second at the Eastern College Athletic Conference Southern Championships in Altoona, Pa. The women's program has captured four crowns and six second-place finishes over the past five seasons. Grove City's golf teams have also excelled in the classroom as 13 players have earned spots on the conference's Academic Honor Roll over the past four seasons. Lamie is certainly no stranger to success as a head coach. She recently entered her 20th season as Grove City's head women's soccer coach. She has led the Wolverines to 201 victories in her first 19 years. Grove City has won five Presidents' Athletic Conference titles under her guidance and made seven total postseason appearances. Over the past five years, Lamie has guided the women's soccer team to 60 victories. 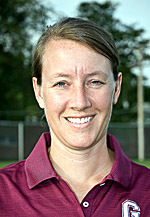 She is the conference's all-time leader in women's soccer coaching wins. Lamie also spent 13 seasons as Grove City's head women's basketball coach. She directed Grove City to eight winning seasons over her final 10 years as head coach. Grove City posted a 153-129 mark over her final 11 years as head coach, including five postseason berths. She graduated from Calvin College in 1992 with a bachelor's degree in physical education. In 1993, Lamie earned a master's degree in physical education from Northern Colorado University. Lamie lives in Pine Township with husband Steve, the College's head men's basketball coach, their 12-year-old daughter Melia, and twins Caleb and Rayna, 2.